Roman and Byzantine mosaics developed at roughly the same time periods and thus exerted influence upon one another. However, both did possess distinct styles, techniques, subject matter, and materials. Whereas Roman mosaics were largely functional, Byzantine structures placed an emphasis on decorative touches. However, both styles were employed to honor religious figures and domestic life. Roman and Byzantine mosaics both developed from the Greek tradition. The Greek tradition originated in road building. Roads were built using colored pebbles, and eventually, those pebbles were organized into patterns. The Romans also used small pebbles in their mosaics, although they did not use them to pave their roads. They also added special cube-shaped clay pieces called tesserae, which added extra color and definition to mosaics. In many works, the tesserae were very small, only a few mm wide, which lent the works a painterly feeling. By the fifth century, Byzantine mosaics often employed glass tesserae called smalti, which Italians manufactured from thick slabs of glass. Occasionally, manufacturers backed these pieces in gold or silver leaf. Romans installed mosaics in public and private locations. 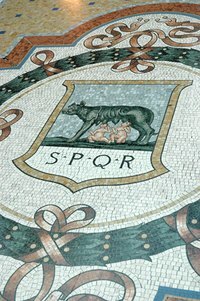 Because of their origins as roadways, these mosaics were often located on floors, especially in bath houses and gardens. As the Roman Empire expanded farther west to Britain, the Roman mosaic technique also expanded. However, British Roman examples often display less skill and complexity than their Italian counterparts. Byzantines were experts at decorating walls and ceilings with mosaics, especially in religious public buildings. The Byzantines also angled the smalti so it would catch the best light and cause the works to shimmer. Byzantine mosaics dominated the Eastern part of Greece and what is now Turkey. Roman mosaics typically feature animal sacrifices, domestic scenes or geometric patterns. However, Christian imagery also appears on some Roman mosaics, like that of the depiction of Christ as the "sun god" in St. Peter’s in Rome. Byzantine mosaics featured a lot more Christian imagery, although some Roman influences can also be seen. As Byzantine mosaics developed, they often depicted subjects with shining halos and shimmering skin. The effect was accomplished with gold leaf and angled smalti. One of the most famous Pompeian pieces is the Battle of Issus, which was discovered in the Casa del Fauno in 1831. This piece represents well the early styles developed by Greeks. By the first to second centuries, however, mosaics had expanded to cover different surfaces, which can be seen at The Golden House of Nero in Rome. The mythological and religious imagery of Rome, however, is best exemplified by the monochrome floors at Ostia. Byzantine mosaics that demonstrate the large wall covering technique of this era can be viewed at the church of Sant'Apollinare Nuovo. Smaller mosaics that focus on saints' halos and skin can be seen in the churches of Hosios David and Áyios Dhimítrios.